Flint, Mich. is what Joshua Introne would call a “food desert.” Most major conventional food retailers have moved out of the city limits, leaving only smaller local stores available to residents. In many cases, these retailers sell unhealthy, old or spoiled food, leaving families without access to a variety of healthy, high-quality options. Introne, an assistant professor in the Department of Media and Information, has been looking for ways to combat this issue. The project took shape when he joined forces with professors Rick Sadler in MSU’s Division of Public Health and Advertising and PR’s Ashley Sanders-Jackson. Sadler had been studying the problem of food access in Flint for several years and Sanders-Jackson is an expert in health and risk communication. The team was approached by the MSU Extension to develop a tool for nutrition education in the city. After conducting focus groups, they found that not only is the food itself a problem, but there’s also a fundamental lack of trust and information flow in the community, leaving people without the resources to find healthy food. The solution? 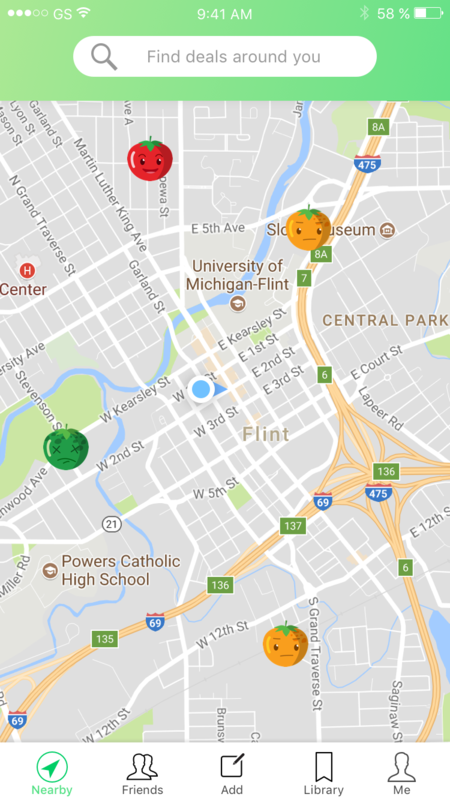 Flint Eats, a social application that will allow Flint residents and food retailers to communicate openly about available resources within the community. The initial version of the app will be released in the spring of 2018, and is geared toward the retailers. If a store has a deal, they can post about it on the app and it will appear in a social feed for users, as well as on a map interface. But when the next update comes out in early summer, consumers will be able to post reviews as well. Introne hopes this will provide incentive for business owners to improve the quality of their food products. “The app is designed to address the trust and information flow issue, while at the same time encouraging people to talk about bad actors and maybe put some market pressure on them in order to get them to change their behaviors,” said Introne. Once the app is in its full-feature mode, there will also be icons on the map that will give an indication of freshness and quality based on community reviews. The system is geographically encoded so users can search for specific deals anywhere on the map or get alerted to deals and sales upon walking into a store. In addition to the map, there’s also a very social component of the application. Like other social media, there will be a feed in which individuals can post reviews, recipes, deals and tips about healthy eating. Each of these posts will be tagged so that if someone were to search “apples,” all deals, tips and recipes that include apples would appear. Though on the surface this application is presented as an app for food, Introne hopes it will help knit together some of the social fabric that has frayed over the years since the departure of General Motors. Flint Eats is also providing a new way to gather data on how to better communicate healthy eating habits. The team behind the app will be sending out various types of messages and tips, in hopes of tracking which types of messages work the best. For example, the app might run a campaign on kale. If more kale is being sold — and this campaign is repeated with similar results multiple times — Introne will be able to say that the messages are motivating people to purchase healthier foods. By providing users with the ability to take a picture and add information about the price, researchers will also be able to keep an inventory of the food sources in real time. Introne believes Flint Eats will have a huge impact for the community thanks to the research collected from user’s purchasing behaviors. Data from the app will provide researchers with a dynamic food inventory that they can use to monitor the food that is available in the city. The project is a part of a larger ongoing effort to address food access in Flint, and will also be useful for other food system efforts like the Flint Fresh Mobile Market and Veggie Boxes programs and MSUE’s Refresh MI Store initiative. A significant part of the process has been to organize a community group to help guide app development and assist with its rollout. Ultimately, the app will be transferred to the community, in which the steering committee will transform itself into a nonprofit.